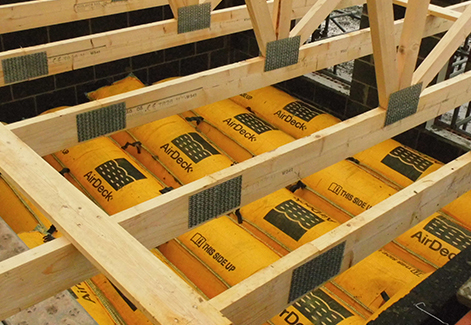 Airdeck is a fall arrest system utilising an inflatable air cushion, designed to protect operatives working at first-floor joist level. AirDeck comprises of an inner liner which is inflated and an outer protective bag made from woven polypropylene. The upper face is made from a double layer to provide additional protection from accidental damage. Portability is the key. 50 bags will fit on just one pallet, which is ideal for transport and storage, and once inflated these 50 bags will cover an area of 80 m2. The bags can be rapidly deployed on site, placed in position and buckled top and bottom if required and then inflated, which in itself takes no more than 30-40 seconds per bag. Once inflated AirDeck forms a cushioned surface 750mm from floor level and offers protection from a fall up to 3.25 metres above the floor level. Odd shapes are easily accommodated simply by pushing a part inflated bag into the gap and then completing the inflation to the normal pressure. Depending on the type and circumstance of a fall, serious injury or even death can occur even when falling from a very low level. A building site is probably one of the most dangerous areas to work and a house-building site is no exception. Working off scaffolding facing into the empty shell of a building poses a huge risk. To enable safe working at this height a fall arrest solution is required to protect the worker in the event of a fall. Where other solutions may impede movement too much to be practical or where time is limited fall arrest bags are an option as they are both effective and quick to move and install. Fall arrest solutions have included fall arrest netting, which though effective prove difficult to install and anchor in a relatively confined space. The most commonly adopted fall arrest solution is the fall arrest bag. Fall arrest bags work by cushioning the impact of a falling body from a relatively low level providing a safe landing. They have the additional benefit that they provide a passive/collective system which means that individual workers are protected without have to take any specific action. In some cases, these benefits mean that fall arrest bags provide the best solution. The first fall arrest bags were modelled on the domestic bean bag, scaled up to a suitable size to make them large enough to install quickly but light enough to be manageable. However, these ultra large bean bags presented their own difficulties – particularly those of transport and storage. The problems of getting these to site and then subsequently removing them or alternatively storing them on site, made their use awkward and costly in spite of the relatively low cost of the unit. What is AirDeck and how is it different? AirDeck offers an effective and rapid solution to protecting workers from the consequences of low-level fall. It offers a fully portable fall arrest solution. Just 50 bags, which will cover 80m2 when inflated, fit on just one pallet, which provide massive transport savings and being easy to collapse fold and store provide an excellent solution for a busy building site where space is always at a premium. It is inflated at point of use by simple use of a pressure-regulated inflator which ensures the optimum protection. AirDeck is quick to inflate and install on site, has minimal impact on site storage and working and yet offers collective/passive fall protection up to 2.75 metres above ground level in line with PAS 59 – 2014. Our fall protection system is filled with air and so has no fire risk issues posed by the fill of a beanbag system. AirDeck is a good option because it provides a ‘collective’ and a ‘passive’ solution to minimising the consequences of a fall, in as much as it offers protection to all people in the area (collective) and it does not require an individual to take any specific actions to activate the protection (passive). This solution offers fall protection to workers up to a height of 3.25 metres above the work floor. 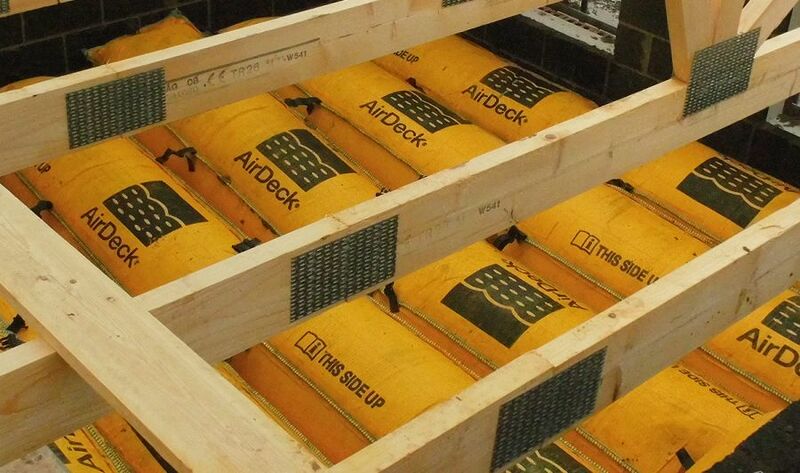 It is quickly installed, as it is inflated in seconds, can be easily transported to the point of use (50 bags covering 80m2 when inflated) fit on just one pallet so AirDeck is easily and quickly transported to site for immediate use. AirDeck will ensure a soft landing well within the requirements of PAS 59 : 14 which states that a 100kg weight falling from 2 metres above the top surface of the fall arrest cushion should not exceed 14g in any one of three directions. Visit the Terminal Velocity calculator on the Sayfa website to test out your own scenario. Conceived originally for the UK construction industry, AirDeck is now used worldwide in many diverse applications, from helicopter maintenance to shipping and from silo inspection, to use in detention centres, to provide comprehensive fall arrest protection whenever there is a need for an immediate, short-term, fall arrest solution.